Been a while since I posted, but thought I'd do a 11 year, 190,000+ KM update. Bought my 2004 RX8 used with 4000KM on it from a private seller in August of 2004. I've had to replace tires (obviously) the starter, and after a squirrel/rat attack had the entire wiring harness + brake master cylinder + engine blanket and other odds and sods replaced. Also blew both coils on rear rotor a few years back, and drove it home resulting in a "melted" catalytic converter. I've replaced the coils and wires and plugs just a few months agao. Other than that, it's been a great car. Last year or so I've been losing power/having poor acceleration. I was thinking of getting a new car, but as it turns out, I had a serious problem with the thought of parting with it. Also turns out, in it's condition, I'd get nothing on trade in. The car was a daily driver (mostly highway KM on it), but garage parked. Aside from a few dings on the body, some scuffed wheels and a few minor interior issues (cracked shifter cover, back of driver seat ripped by kids, homelink button worn) she's in amazing shape. I managed to get a line on a fellow in Abbotsford BC that does rebuilds. For $5525 (including new clutch) I had it back in under a week. Steve was really surprised at how good a shape the clutch was in, but we replaced it anyway. It's great to have it back and running as good as new. Can't wait to get it broken in! Were you able to reuse the plates and housings? I've would of gone with Ianetti Ceramic Seals...Its like 2k but probably well worth it. Was able to reuse the plates, but not the housings. Steve does a lot of work with Atkins Rotary parts, but that was the first build he'd done with those in my engine. Dude, Awesome! Keep us posted on how the rebuild holds up; it's only a matter of time before I'll need the rebuild and it's great knowing that I could keep the car in the country to do it! Do you have any more info on the shop you used for this rebuild? Yeah I agree Steve is great, he helped weld me a new down pipe for my RX7 FD. As well I just recently took my FD over to him to get my Compression test done. 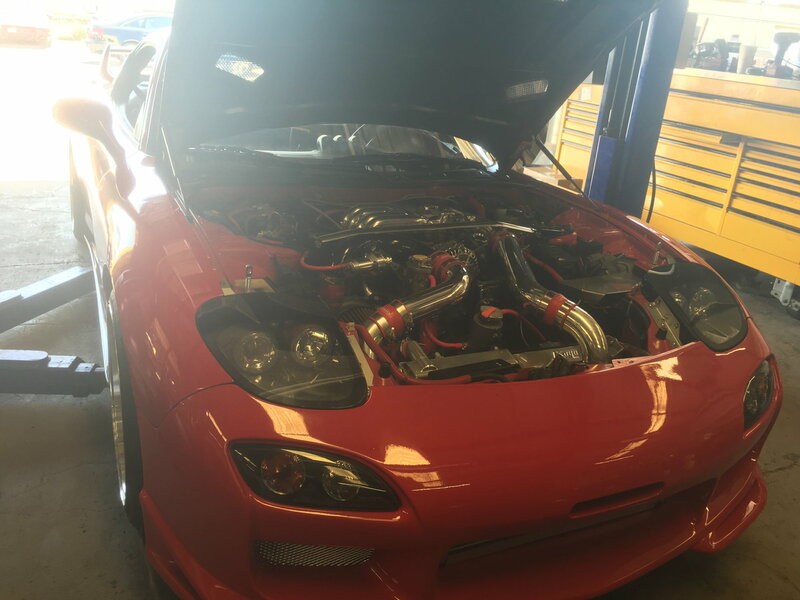 Day i took my fd to get compression checked by Steve. Last edited by Bokie469; 04-09-2016 at 01:58 PM. love the pictures, did you get any kind of oil modification? glad to see you kept it. good to know that theres a capable mechanic in the valley, where is he located? Last edited by olyrx7; 05-15-2016 at 08:46 AM. Thanks I'm from abbotsford I think ive seen the shop, forcefed is it? ForceFed is a different Company. They do REW swaps into 8's..but not too much work on the stock ones. You got alot of research to do, surely you didn't hear that from this site. A REW swap is going to cost you big time $$'s compared to FI on a renny. Nope two completely different places. Aside from doing REW swaps in the 8's Steve also does amazing work on Renesis engines including Street porting, performance upgrades and regular maintenance if thats the road you decide to choose. Last edited by olyrx7; 05-15-2016 at 08:57 AM.